When Cece Bell was four-years-old she developed meningitis, which left her "severely to profoundly deaf." 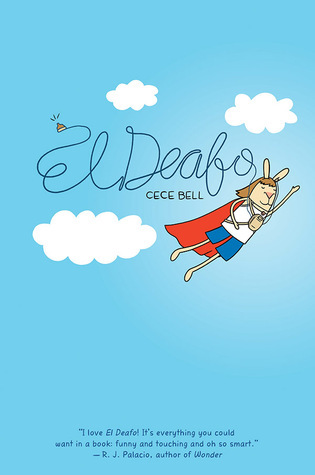 El Deafo is the story of how Cece learned to navigate a new world, as someone who was born hearing to now having a significant hearing loss. 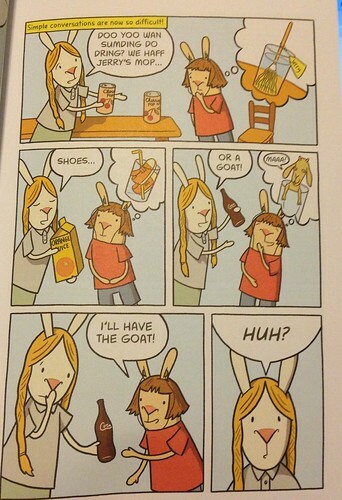 El Deafo is wonderful book that is certain to go right next to Raina Telgemeier's Smile in canon of children's graphic memoirs. And to think, I almost didn't put this book on my to-read pile! I don't know what I was thinking! But as soon as I watched the following video where Bell talks about the story behind the book, I just knew I had to read it. Bell has created something to appeal to both camps of readers: those who like realistic stories and those who like fantasy and/or superheroes, as she imagines herself the superhero El Defo when she is feeling especially socially insecure about her disability. Bell grabs readers from the very beginning, as we see Cece as a four-year-old who refuses to wear anything but her bathing suit. That detail seems small, but it somehow gets the reader to fall in love with her from page one. Similarly, trying to figure out why all of Bell's characters are rabbits in this book is somewhat of a head-scratcher, but in an amusing way, not a frustrating way. It is likely that the rabbits' big ears force the reader to focus more on young Cece's hearing aids and therefore was a natural way to call attention to the disability/superhero power of Cece/El Deafo in those moments of insecurity when she calls upon her superpower. Whatever the case, it works! Often we say that books can be either mirrors or windows, and El Deafo is one of those books that illustrates this concept beautifully. Not only will it speak to readers who feel different because of a disability or deficit they might be struggling with, but it's also a window for those of us who have never known a deaf person, to walk a mile in their shoes and cultivate our own empathy. 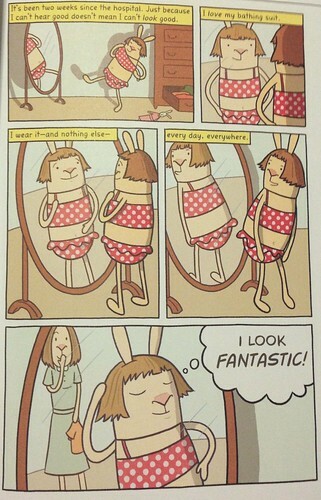 El Deafo is one of those graphic memoirs that belongs in classrooms of all grade levels. It will appeals to elementary, middle, and high school students equally. Of that I have no doubt. That's it-- definitely reading this one tonight! What a gorgeous-sounding novel! I hope I find a copy soon.